My son stayed here for 4 nights to meet up with the rest of the family who were staying at the Safari Park for 10 nights. It's rated as 3* but is more like 2*. Location is very central, although at the end of a cul de sac so not the easiest to find. The local stray cat population live on the wasteland opposite reception. First impressions were not the best and not helped by the man in reception who told him that he should not bother checking in as the hotel was awful, he'd be best staying somewhere else. He was given the safe key instead of the room door key on check in, so had to revisit reception to get in to the room. He booked self-catering, many guests were on AI and seemed less than impressed and paid £20 per night for the studio, it was basic but clean although the fridge didn't work until the 2nd day and no cleaning was done while he stayed. As it was just a base and he didn't use the hotel facilities it was fine but he'd pay a bit more and stay elsewhere if he returned. Overall - as expected for the price paid, don't expect too much! We arrived at the hotel at approx. 1.30am Friday morning following our flight and our long transfer, we were greeted by the night receptionist and given our wristbands. He then drew a map onto a scrap of paper, we had been put into an apartment block over the road. We were not offered anything to eat or drink and all of the shops as far as we could see on the way in were already closed. The apartment had no air conditioning and the heat was unbearable, it smelt really bad too. We had paid to be All Inclusive and these apartments were away from the hotel and had self-catering facilities. We had no pillows and one bed was a sofa in the lounge. Straight away we reported back to reception and said that we were not happy with our rooms and would like to be moved into the hotel, there were no other rooms available. There were no pillows available so we had to sleep on rolled up blankets shoved inside pillow cases. At this point we were 6 girls in 2 apartments and we felt very unsafe, there is no reception area and anyone is able to walk into the apartment complex at any time. Friday morning we woke up, everyone was upset as we had no sleep in the unbearable heat. The manager was due in at 10am so we went to talk to her after breakfast. The manager never arrived and there were still no rooms available. I eventually spoke with Aftersales and she liaised with the hotel on our behalf, we were promised 2 rooms in the hotel Saturday morning. Saturday came and by this time we had spoken to other guests that were staying at the hotel and the rooms sounded just as bad! We decided to grin and bear it and stay put, at least our rooms were side-by-side! Our bed sheets were not changed once while we were there, housekeeping just came and remade the beds with the same sheets, by Saturday evening we had no clean towels and were still sleeping on rolled up blankets. Reception informed us that the hotel had ‘run out of clean towels’ we had just arrived back from a day on the beach and needed to shower! 2 of my friends went to sort this out and had no joy at all....in fact my one friend was totally insulted by the staff and their friends on reception! We didn’t get our towels or pillows until nearly 6pm that day. We arrived at 2am in the morning to be greeted by a friendly night manager we were given a room on the 1st floor with a large balcony overlooking the pool. We had to pay 10 euros each for the AI wristbands but you get that back at the end of your holiday. Pool area was clean but you had to be up early to get a sun lounger they use plastic cups for drinks to avoid broken glasses I think this was a good idea. The food is good plenty of it you always get something to eat. My kids are really fussy eaters and they got enough, we did eat out on a few occasions and really enjoyed this. AI could have had more choice throughout the day it was limited between 10-1 you could have chips, sausages or nuggets and ice cream. Then in the afternoon between 2.30-6.30 you could have biscuits, cakes and ice cream. In the evenings you could have ice cream and a tray of sandwiches which you helped yourself to. They need to improve this aspect of the AI. Rooms were cleaned every day except wed the maids were off. My little boy was sick on the Tuesday night and reception were really helpful getting me things to clean it. Also the next day they were up and bleached the bathroom for us. Towels were changed every day and when I asked for clean ones on the wed because there was no maids they got me them. There is no aircon so you will need to hire a fan if you want to. Also if you want a TV this has to be hired. The entertainment could have been better. There was a kids club it was run from 11-1 each day my little boy really enjoyed it. They did water polo in the afternoons. In the evening there was a kiddies disco, bingo and a show, the shows were more for the children i.e., reptile show, birds of prey show and there were 2 girls singing Abba songs. Near the end of our holiday the entertainment manager was sacked and a new one brought in and we noticed a lot more activities going on and he had dressed one of the girls up as Minnie mouse to greet the kids as they went into the dining room. I feel the entertainment is going to really improve in this hotel as the season goes on. 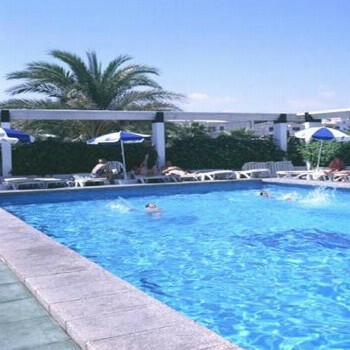 Hotel in a great location just round the corner from the shops and a 5 minute walk to the beach. Overall we had a good holiday and my children really enjoyed themselves so don’t be worried about going to this hotel you are paying for 3 star in Spain not the UK. If you want 4 or 5 star you will have to pay for it. I have stayed at hotels in Majorca, Menorca and Benidorm 3 or 4 times a year for the past 10 years, so I know what is the usual standard for 3* AI. In my opinion this hotel failed miserably. I wouldn't go there again. When we arrived we were checked in quickly but then led down the road to a tatty block of apartments. We had booked a room at the hotel. I requested the original room we had booked but was told to come back the next day. The apartment was ok except the toilet wouldn't flush and it was surrounded by bushes and looked very tatty. There was a nice pool but the cafe/bar was derelict and surrounded by cats, rubbish and even a supermarket trolley! We were moved on the second day (after making a big fuss in reception, standing with our cases and refusing to move) and the second room was exactly what we had booked. It's a shame they didn't want us to have it. The hotel was not particularly clean and our bedding was not changed during our 6 night stay. We did not get clean towels either, even though they took the dirty ones away. All inclusive is a joke at this hotel. If we had stayed at the first apartment, then we would have had to walk up the road every time we wanted a drink. As it was there was only one person on the bar so it always meant a 20 minute wait for a drink. The food was awful. We are not fussy eaters and usually find something when we stay on AI, but we couldn't make out what most of it was and it was all greasy. Even the salad was unappetising. We lived on bread, cheese, chips and pasta all week. The staff were not helpful and always looked miserable. Mind you, I would look like that if I worked there. The entertainment was boring. My 12 year son actually asked to go to bed on a couple of nights. It was a kids disco followed by bingo every night. They did try to get the guests involved and the funniest night was when 4 men dressed as women, but if they hadn't been such good sports, it would have been another boring night. I got the impression that the hotel was trying to drive guests away so they didn't have to serve drinks etc. The pool area was OK. It's not the best and safest I've seen, but it wasn't too bad although there was a lack of sun loungers and too many chairs and tables. This has to be the holiday from hell. The food is absolutely diabolical, you wouldn't feed it to the cat. I had to eat out for 3 days, it is cold, bland, tasteless and totally inedible. The staff are incredibly rude, the entertainment is pathetic. Good places to eat are the Britannia, Royal Oak and Dolphins, all serve huge portions and the food is fantastic. The Hotel website reports yhay there are satellite tv in the rooms, there was not. It also states telephones in the rooms, there was but they were not in working order. It also stated bed linen changed once per week, ours was not changed during the whole fortnight. Hotel cleanliness was reasonable, but the cleaning of rooms could have been better. For a 3 star accomodation we did expect to find an electric kettle, toaster and possibly a microwave, there were none of these, we couldn't even make a slice of toast. On complaining about this to reception we were shown a list of items which could be hired from a local shop, we hired a microwave 10 euros per week plus 10 euros deposit. The swimming pools were great the pool furniture was not,most of the loungers could not be raised from the laying flat position. Entertainment, we only saw any on 3 nights the whole 2 weeks. All-in-all this hotel should be downgraded to 2 star at the most and requires a fair amount of refurbishment. Normally I dont agree with bad reviews, i think that people are just being fussy and expect too much from a 3* but this hotel is quite terrible really! The hotel was quite clean (not the towels though) and during my stay there was ONE nice member of staff which is why I gave such low ratings. I do stress ONE nice member of staff as we were greated by a very unwelcoming lady. We ignored this at first though and went to our room, my mum is scared of hieghts though and we were on the fourth floor, we understand it can be difficult to be moved as it was busy. We went to the desk, my mum really stressed and quite frightened, the same woman was there and she began to deal with the situation, but then after a short while moved on to other clients ignoring us. eventually we were told we could be moved to a room on the first floor on the tuesday (arriving on the sunday) which was understandable, but why the woman was so rude about it I don't understand. Also we saw that she was giving some other all inclusive clients a blue wrist band which we were only then informed about, they were given at a deposit which was in itself rediculous because we had already paid to go all inclusive. We were told to retrive the deposit that we would have to hand them in by 12pm on the last day (we wern't leaving until 6pm) and we would not be allowed to use the all inclusive facilities! This has never been the case in any all inclusive hotel I have been in before. We paid the deposit as we had no other choice and went for dinner as it was 1pm. There was pork, fish, soup, some 'off' looking salad, chips and pasta. the next meal there was a choice of pork, fish, soup, some 'off' looking salad, chips and pasta (as you can guess this followed throughout the week) Some times deserts would change, well only the colour of the topping though. The bar was alright, although water had to be asked for you could not just get your own, I didnt want to go to the bar, the man was very rude and unpleasent he made out it was a big effort to get me some water!!!!! After lunch on the first day we went to the room and got changed the bathroom was nice and clean although the towels had some, well, stains on them...... hmmmm. we went to sit by the pool and managed to get 2 sun loungers which was difficult and a broken parasole which blew over every time there was a slight breeze. around the pool the guttering was broken and dirty but the pool itself was ok.
Evening. Well there wasnt any minidisco even this night and so no hope of any further entertainment (even though it was advertised on the board). We went out. To the Brittania, it was nice in there expensive, but well we had nothing else really to do. Infact there was no adults enetertainment until thursday, and even for the kids the disco was over within about 10 mins cuz the cd seamed to break down and then the 'entertainers' gave up. No enthusiasm at all. We made numerous complaints whilst there but they were ignored and we were told there was nothing that could be done the majority of the time. On the final day we gave the wrist bands in, this wasn't so much of a problem in the end we didnt want to eat there anyway. There was also a perfectly good room for entertainment which was not used. The one night of bingo (which suprise suprise we had to pay for) there was no microphone used to call the numbers and other guests had to call the numbers in order for everyone to be able to hear. We had to pay for the pool table, and also for table tennis. On the last day when we saw the manager for once, he denied our claims, told us there had been beef on the menu (lie) told us that we were told the 15 euros for the safe was for rent (lie) told us there had been entertainment on all week (lie) and when i pointed out that he hadnt been there all week he simply remained silent. we had to use the luggage room because obviously we had to leave buy 12. I asked the woman on reception (the same one as when we first arrived) whether or not we had to pay for this facility too and she replied "well we could charge for it if we wanted to we are not obliged to proved it" (which they are) but i thought this was rude, true there was some sarcasm in my enquiery but it was also genuine, they had charged us for everything else. Also it states on the webiste there is a satelite tv in the rooms (lie) and a telephone (true but you cant use it or the pay phone down stairs) It also states there is a lounge a pool bar but the pool bar is the only one in use!